Here we are eighteen months after this all began and it is over. There was a definite finality to this ending so I’m happy to be here at the end as I was at the beginning. Iron-Blooded Orphans has been one crazy ride right from the get go and it was a series that kept you guessing every step of the way. Honestly I did not predict this ending, though in hindsight with everything that has occurred in the series it was the only way the series could end without defacing what had come before. I will get this right off my chest Iron-Blooded Orphans is likely my favorite non-Universal Century Gundam and likely the best as well. To be the very best there is stiff competition from masterpieces like Chars Counterattack and War in the Pocket so to avoid a fight with myself I’ll split off those Universal Century stories off. However thinking on it those are movies and OVA’s not a series. Hmmm... Iron-Blooded Orphans may yet be the best Gundam TV anime, go figure. Edit: Thanks to everyone for making this my biggest IBO post ever! Great way to go out! As “Their Place” opens up Tekkadan is on the edge, frantically trying to buy time as the rest of their comrades escape. However with the exception of the Gundams those on the battle field are hopelessly outmatched and outgunned, the longer they stay out there the chance of death approaches 100%. As such when the tunnel is complete Eugine and the Ryuse-Go team are ordered to fall back by Mikazuki, invoking Orga’s last orders. 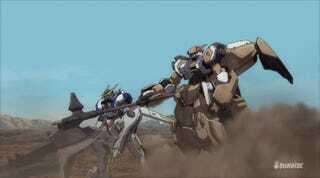 With the non-Gundam forces retreating it falls on the shoulders of Mikazuki and Akihiro to cover the retreat. Luckily for Tekkadan Akihiro’s shoulders are big enough to carry such a heavy burden, as the “Muscle Team” actually takes an advantage over the numerically superior Gjallahorn forces. Fighting now not for their own lives they fight for the lives of their friends, making their final stand. However Rustal Elion has other plans. Understanding the monstrous power of the Gundams, things that can bring down a monster like a Mobile Armor single handedly he uses an equally monstrous weapon. Launching a full barrage of the Dainsleif weapon system from Orbit, the Barbatos Lupus Rex and the Gussion Rebake Full City are critically damaged. However much in the same way that the Barbatos reacted during the mobile armor encounter the two Gundams limits are released. Embracing the full power of the Gundams and the image of demons, the two injured and critically damaged push one last time and it is GLORIOUS. A fight that brought tears to my eyes the visceral feel of the battle was amazing. By forgoing beam weapons for melee this series was always more brutal then others, however nothing compared to this conflict. The Barbatos ripped and rended the opposition, Mikazuki truly was a demon. One scene in particular though stands out. The death of Iok Kujan. Only launching once his opposition was near inoperable idIok rushes out to make the kill. However Akihiro and the Gusion can still put up a fight, just as it appears Iok is about to secure the win he announces his name to his opposition, causing Akihiro to go into a rage. Picking up the Vice-Grip from the sand Akihiro gets Iok’s suit in a grip, despite being finished by two of Iok’s subordinates the huge pilot gets one of the most satisfying kills of the series as he slowly crushes Iok and his suit, ending the Kujan line once and for all. Following Akihiro’s death it is up to the Devil alone to continue the fight. Julietta the only named pilot left on the field comes to a realization during her fight with Mikazuki, they fight to secure their existence. There was no other reason to fight, they do so because they have nothing else to do. As such when Mikazuki finally succumbs to his injuries against Julietta’s barrage its a fitting end and honestly the only way it could end. Mikazuki, Akihiro, and the rest of the Gundam pilots weren’t like the rest of Tekkadan they knew one thing and one thing only to fight. Mikazuki was born the day Orga saved him by killing, Mikazuki’s entire life was defined by death. Had he survived this fight he’d merely have picked another and another, for it was all he knew what to do. We can cry for the death of our protagonist however from a narrative perspective it was probably one of the best end points a Gundam protagonist ever had. Shades of Amuro and Char’s inconclusive end at the end of Char’s Counterattack. Following the fight a massive time skip likely six to seven years at least takes place. We’re now treated to the aftermath of the “McGillis Farheed Incident”, which funny enough turned out pretty good for everyone involved. Due to the deaths of several key members of the Seven Stars the oligarchy is abolished and Gjallahorn is reformed to become more democratic. The first leader of the new Gjallahorn is none other then Rustal Elion the hero the McGillis Farheed Incident. Elion proceeds to take Gjallahorn in a completely new direction removing the Earths economic hold on Mars effectively granting Mars its freedom and independence. As I wrote previously I never saw Rustal Elion as a “bad guy” he was merely the most competent opposition to the Tekkadan/McGillis alliance. This epilogue bears my view out; Rustal Elion actually shared McGillis and Gaelio’s disgust with the actions of Gjallahorn. Once Elion had accumulated all power within Gjallahorn he showed his true intentions which ironically was exactly what everyone had always wanted to reform the world, his path to doing so was merely different then McGillis. This shows once again Iron-Blooded Orphans was never about good vs evil, it was merely about conflict, survival, and doing what needed to be done to move on to find ones place in the world. It is why I love this series so much it was completely different from what came before. Everyone was so complex but fit together so organically like a real conflict would. We have Rustal Elion who was never evil he was just in conflict with our view point character, we have McGillis who was profoundly broken and did horrible things all for a good cause. While we have Tekkadan ruthless child soldiers who have racked up a higher body count then most Gundam antagonists but did it all to find a place in a world that never wanted them. As the epilogue continues we see many of the Tekkadan survivors have found their place in the world. Eugine stands by Kudelia, Kudelia stands as the Chairman of the Mars Union, while Gaelio and a now grown up (and gorgeous) Julietta seems to have found each other. Which is a ship I didn’t know I was shipping but am totally doing so now! As the world slowly changes and the family Tekkadan finds their way in it some characters seem to remain living in the past. The biggest example of this being Ride who in the final moments of the series shoots Nobless Gordon dead execution style after asking “Do you remember Orga Itsuka”. Even in this new world it looks like Ride is struggling to find his place, damaged by the events of the series. Which considering his age and how much death he experienced is not a surprise. Finally the series ended on a sweet note as Kudelia seems to uphold her pledge to Mikazuki to help Atra raise his child. Akatsuki the baby conceived on the eve of the final battle has grown up to heavily resemble his mother, though both women agree he has traits of his father. Interesting Akatsuki means Daybreak in Japanese showing that dawn has finally come for the people of Iron-Blooded Orphans where the time of killing has finally passed. All around it was a bitter sweet ending to an amazingly written and directed series and I have no complaints. While Iron-Blooded Orphans was like nothing we have ever seen before from Gundam it truly was an great trip and one that I will miss dearly. Our time with Tekkadan and their enemies in Gjallahorn may be over but to go on would be a disservice, this ending was perfect. - Everyone who piloted a Gundam died with one exception Gaelio. This is interesting as every Gundam was named after a Demon save Gaelio’s his was named after a God. I do not thing this was a coincidence. - Everyone got hot as they aged. For a series that really embraced the manservice the young Tekkadan members really grew up, seriously if those designs were used from the start Gundam Wing would have to give up its bishonen king card. - The Elion/Kudelia alliance to bring about the end of Human Debris was another highlight of the epilogue. As for Rustal there is really no reason to do it other then its the right thing to do. Strengthening the arguement he really was a good guy all along. 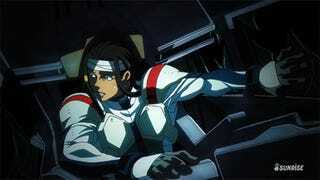 Hell I’d rewatch season two with the view point flipped focusing on Rustal Elion and Gjallahorn to get his side. OVA idea! - Who else cried a few times during this episode? I know I did at a few of the deaths and the monument at the end. - I love how the ending of the ending theme was worked into the final shot of the series as its revealed Biscuits hat and pictures of Tekkadan are from Akatsuki’s room. Lets get this out of the way in the main write up as this seems to keep coming up. Tekkadan didn’t lose. In a conflict what is victory? Victory is simple it is achieving your strategic ends. What was Tekkadan’s strategic ends then, the first was to help Kudelia. Her goal was to end the Earth Sphere economic subjugation of Mars that was achieved. The second is for the remaining members of Tekkadan to find “their place” in the world whatever the world may look at - also for the most part save a few (Ride) that has also been achieved. As you can see while their were sacrifices along the way Tekkadan was victorious. Just because it was not Orga and Mikazuki implementing their ideals does not mean their ideals were not implemented, furthermore by all accounts and standards lets be frank Orga and Mika the codependent emotionally damaged pair being “Kings of Mars” likely would have been a bad thing as it would have resulted in bad outcomes. However this ending resulted in literally everything Tekkadan was stated to believe in happening. How is that losing again? Well this quote makes a lot of sense now doesn’t it? I think the choice of this song is pretty obvious. Hope you enjoy it! This is our last Gundam Music of the Week. PS: If you like Gundam and these write ups well there will be a bit more content down the pipe shortly as I’ll be doing Gundam Thunderbolt my write up for Episode 1 is actually already done.